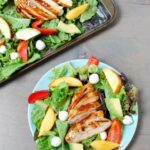 A light and fresh summer lunch or dinner, this Grilled BBQ Chicken Salad is simple, healthy and full of flavor! I’ve decided that any time I need to serve salad for a crowd from now on, I’m doing it on a tray. So much easier to get the right ratio of greens to toppings. You know how it goes when you put it in a big bowl…you either have to take ALL the topping to get to the lettuce, or all the toppings fall to the bottom and all you get is lettuce. Trays solve that problem. Plus it makes it way prettier! I’ve had the idea for this salad in my head ever since I ran across this stunning caprese salad. 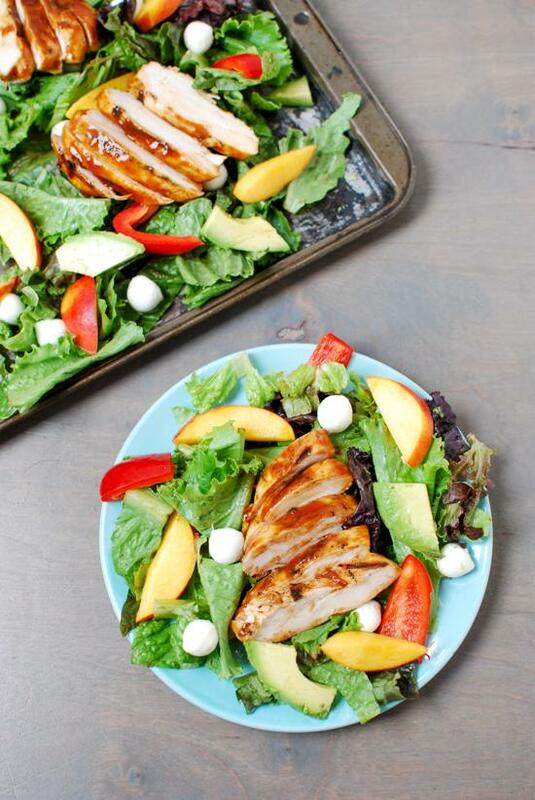 Then earlier this week Erin posted this Peach Salad with Grilled Chicken earlier this week and it was just the kick in the pants I needed to get this post together! I would file this salad under “delicious ways to use leftover chicken”. You guys know we often bake or grill up a lot of meat on Sunday’s during food prep and I’m always thinking about new and different ways to use it throughout the week. 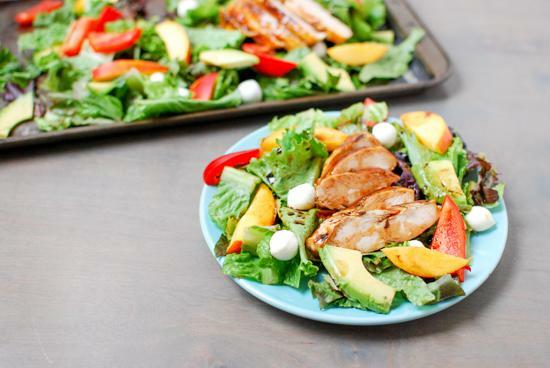 This week hubby grilled up some bbq chicken and I thought this salad would be a great way to eat some of it for lunch! I added nectarines because I pretty much live on them during the summer, avocado because, duh, red peppers and these cute little mozzarella balls! If i’d had my act together, I also would have added yellow cherry tomatoes and red onion…but I was fresh out. Next time! Also, I used leftover chicken for this but if I was making it and serving it right away, I would’ve grilled the nectarines and red peppers and onions before adding them for some additional flavor. Grill chicken. Baste with bbq sauce while cooking. Cover baking sheet with mixed greens. Slice chicken once cooked and add to salad. Note- you could easily make this plain grilled chicken and skip the bbq sauce. I dressed mine with just a little balsamic vinegar…but use your favorite dressing- or check out this roundup I just did for Parade of 8 Simple Summer Salad Dressings. Any of them would be delicious on this salad! 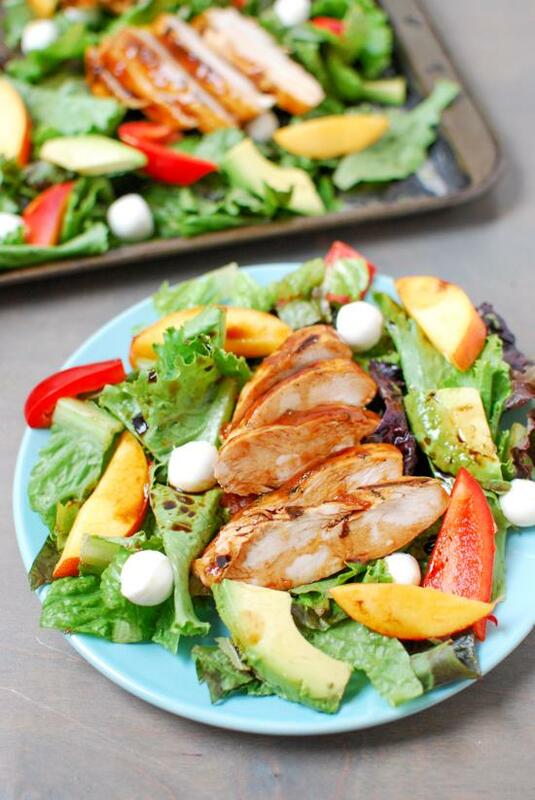 This Grilled BBQ Chicken Salad from @leangrnbeanblog is the perfect summer lunch or dinner! I LOVE THE TRAY IDEA too. This is definitely a go-to summer salad! Beautiful. Seriously, this is such a great idea. I never would have thought to serve salad with lots of toppings in a flatter container compared to a bowl. It’s definitely annoying when you have to dig around for a good assortment of toppings and greens. Yum! This is my kind of recipe! Great minds using leftover chicken for salads this week! 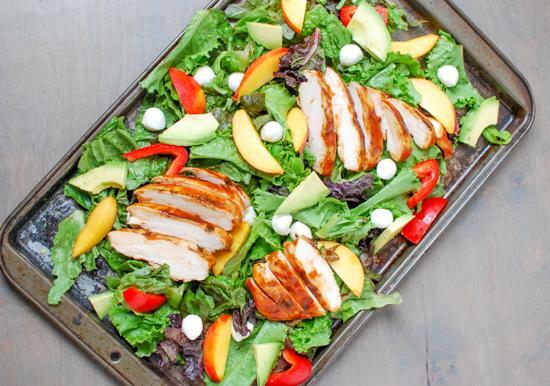 Love the idea to serve salads on a tray – another #whydidntithinkofthat moment! Looks awesome! Nothing beats fresh veggies and grilled chicken. The tray ideas is genius…I’ve seen caterers use long serving platters for salad, but never thought to try it. Yum! Looks like the perfect summer recipe. That looks delicious! What a fabulous idea! seriously scrumptious linz! i love BBQ chicken. When’s lunch tomorrow? I’ll be there! That looks delicious. And I love trying to get avocados into anything. We are always in a rut trying to come up with new dinner ideas and that looks perfect for summer.